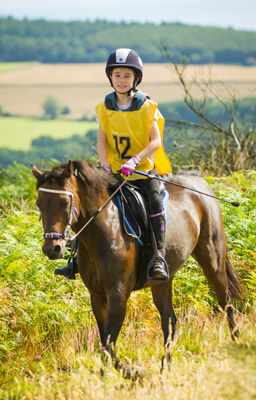 Endurance or Long Distance Riding is a friendly, fun sport which is available to anyone with a horse. No special equipment or horse is needed and it is all about riding through beautiful scenery, making new friends and, above all else, having a good time. One thing appealing about endurance is that for most rides you are not competing against anyone. It is just you and your horse, enjoying yourselves with a reward at the end. At local level you may wish to take advantage of our 'Associate membership' scheme at a reduced cost before becoming a full member of Endurance GB. Pleasure Rides or 'Non-Competitive/Social Rides' are exactly that - short 'fun' organised rides usually of between 12km and around 32km in length. These rides are to be completed between 8km - 12km/hr which is quite attainable at a steady pace for any horse in regular work. These rides can be used to introduce your horse to endurance riding and build up the stamina required for the longer distances. Competitive rides start at 32km in distance and go all the way up to 160km (100 miles). At graded level your horse will be checked over by a vet before and after the ride and your results, or 'grade' will depend upon your average speed and your horses final heart rate. Graded rides are ridden at Novice, Open & Advanced Level as you progress with your horse to compete at longer distances. Anyone registered with Endurance GB is eligible to register their horse and compete at Novice level. Once you have reached advanced level you are able to compete at higher distances of 80km of more. You may choose to compete in endurance rides rides. At this level there is no top speed and you are competing against other competitors who set off along side you. From this level you are able to qualify for FEI competitions.